When a baby is born, the baby will be surrounded by all of its family members full of smiles on their faces no matter what the baby does. It is a very pure beginning moment of a person’s life. 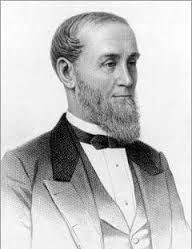 Alexander Turney Stewart (A.T. Stewart) was born into a great caring family in Lisburn, Ireland on October 12, 1803. His Scottish Protestant parents were smiling at Stewart’s face. For A.T. Stewart, the smiling should have lasted on his face for a long time. However, Three weeks after his birth, Stewart’s father died of tuberculosis. One can only imagine how many different emotions his wife had to deal with at that the time with a new baby boy--unaware of the tragedy—that would never be able to call out to his dad. This would not be thought to be a great way to begin one’s life, but anything can happen in life and one can never know how a story might end. Indeed, A.T. Stewart became a successful Irish entrepreneur amassing a multi-million dollar fortune from running the most extensive and lucrative dry goods business in the world to date. Stewart’s mother had to find a new life. She remarried and followed her new husband to America, leaving Stewart behind. At the age of two, Stewart was sent to his grandfather, John Torney, to be raised. At age seven, Stewart went to a village school, and in 1814 entered Mr. Neely’s English Academy. It seems that Stewart followed his education path pretty well, even without the support of parents. However, his normal life did not continue for a long time. In 1816, his grandfather died, so he was brought into the home of Thomas Lamb, an Irish Quaker. Surprisingly, he successfully completed his formal education at Belfast Academic Institution. After that, he wrote his mother in New York City. Here are some business lessons from A.T. Stewart. 1. A.T. Stewart was independent. 2. A.T. Stewart was mature. He left Ireland for New York after completing his formal education at Belfast Academic Institution. He might have really been missing his mom and just wanted to follow her immediately after she left to New York for her second marriage. But he waited. When Stewart went to New York, he may have been inclined to stay with his mom and rest there. However, he started his career by gaining experience as a tutor. Successful behavior comes right along with maturity. The business world is much friendlier to hard-working adults and the world expects us to make mature decisions. 3. A.T. Stewart was wise in the use of his inheritance from his grandfather. At the age of 19, he received somewhere between $5,000 and $10,000 as an inheritance. He could have easily squandered the money and it may not have come as a surprise from someone of such a young age. But, right away, he started his first business with the inheritance and the funds he earned from his tutoring. Having enough capital to start up and keep a business running is essential. The way the profits of a business are spent also plays an integral role in the success of the business. This is the reason why companies hire a consultant or analyst. Incompetence in the handling of finance can be fatal for a business. 4. A.T. Stewart was creative in building his business. When he first opened his store on Broadway, he displayed all of his merchandised goods in front of his store so that all passersby were able to see all of his merchandise. This is an innovative business strategy. Such is a method of display and advertisement used frequently today. 5. A.T. Stewart knew how cater to women. As a guy, Stewart would naturally understand what a guy likes, but he probably had to figure out what a women would be looking for. A full-length mirror is a favorite item for all women in the world, which is just one example of numerous ideas he implemented that drew many women to his store. 6. A.T. Stewart expanded his business for customer’s convenience. At the beginning of his mailing business, he started because of a customer’s request. This was not something that he initially thought of but in his efforts to satisfy the needs of the customer he took it and ran with it. A company mostly tries to bring unique ideas for attracting customers. However, the best ideas can come from a customer’s need.